When baling in very dry conditions, there are several things that you should keep in mind. One thing that you should watch are your bale temperatures. It’s important that you keep your internal bale temperatures below 135 °F in order to avoid damaging the hay in the bale. In the video, Dave is baling in the middle of the day with temperatures around 100 °F. The high ambient temperatures aren’t ideal, but the bales are still very nice looking bales. In these very dry conditions, we want to make sure that our bale temperatures are still in the safe zone of under 135 °F, so Dave uses a probe to measure the bale temperature. Please note that it is important to let the probe sit inside the bale for a few minutes. Dave determines that the bale temperature is 121 °F and that it is safe to continue baling. 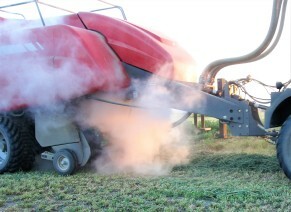 For more on managing bale temperature while baling with steam check out this blog post. Another thing to keep in mind is the stacking of hay that is baled in hot, very-dry conditions. To avoid discoloration of the hay in the stack you should not stack hay that is above 115° F inside the bale. That means that you may have to let the hay sit overnight before hauling and stacking the hay when baling in hot, dry conditions. Although you can produce very good looking bales in the day, bales at night tend to look better. When baling in hot, dry, and windy conditions, we’ve found that one particular valve setting allows us to produce better quality and better looking bales. It’s the same valve setting that Dave is using in the video. As described in a previous blog, there are four manifolds attached to the baler as shown in the pictures below. 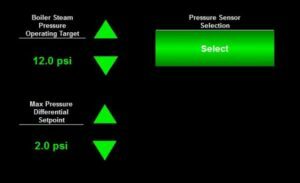 We can control the steam rate of each of these manifolds independently from each other. When baling in hot, dry, and windy conditions, it’s best to set the master steam rate near 100%. Then, turn the top front and bottom front steam manifolds down to 70-75%, and leave the top and bottom rear manifolds set at 100% open. See picture below. 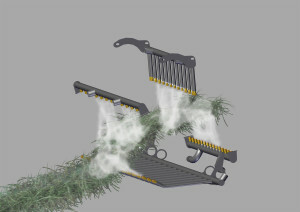 This will provide enough steam to retain leaves at the pickup while allowing more steam to be distributed to the top and bottom rear manifolds, where the moisture will hold better as the hay is being pulled into the flake chamber. This will improve bale quality in these adverse conditions. 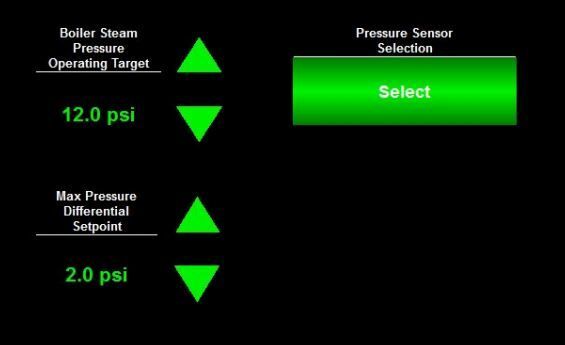 For more information on valve settings in different scenarios please visit this blog post. When dealing with hot, dry, and windy conditions, there may be occasions when you just need to get more moisture (steam) into the hay. In the video, Dave is applying the max amount of steam and is seeing bale moisture levels around 12%. 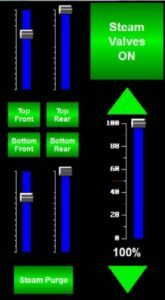 His bale temperatures are looking fine, so he decides that he’d like to get a little bit more moisture in the hay.. To do this, he raises the operating steam pressure from 12% to the max operating pressure of 13%. By performing this simple trick, he was able to raise bale moisture levels from 12% to 13%. You must monitor bale temperature closely when increasing steam pressure because the more steam you apply to the hay, the warmer the bale will get. Remember, bale temperatures should never go above 135 °F. Although baling at night and during cooler hours of the day is ideal, there may be times when you will need to bale in adverse daytime conditions because of impending rainstorms or other threatening weather events. When you do have to bale during very dry and/or windy conditions you can still make good hay with acceptable bale moisture.